Ray-Bar Lead Lined Telescopic View Windows are manufactured for ease of installation in rough opening after wallboard is installed, with over 30 sizes “good in stock”. Designed for use in medical applications, it achieves a minimum lead equivalency of 1/16" (1.6mm), with X-Ray Protective Lead Glass factory pre-assembled into each of the Lead Lined Telescopic View Windows we sell. Standard frame construction is 16 gauge galvanized steel Jetkote/Paint lock. Other available options of frame material are: hot dipped galvanized steel, powder-coated steel, stainless steel, aluminum, or anodized aluminum. 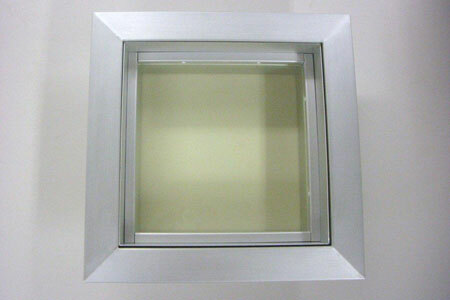 All of Ray-Bar’s X-Ray Lead Glass products are available factory set into these frames prior to shipment. All standard sizes are "ready to ship" in just 2 to 3 days. Custom sizes, frame profiles and material options are available in only 10 working days. Ray-Bar proprietary lead lined telescopic view window frames are fabricated from 16 gauge Jetkote/Paint Lock material providing a rust resistant, paint ready surface, with 1/16" (4#) lead lining standard. Higher shielding value ratings are available upon request. Standard Ray-Bar X-Ray Lead Glass is 5/16" thick, providing 2.0 mm (5#) lead equivalent of shielding value. Ray-Bar X-Ray Safety Glass is available upon request, labeled to meet impact resistance ANSI Z97.1 and CPSC 16 CFR 1201 Cat 2 and is required in any window within 24" of any door opening, per glazing safety codes and regulations. All x-ray windows should be located at least 38" above finish floor (or more), and utilized in interior applications only. Please note: x-ray lead glass cannot be tempered as it is physically impossible due to its low melting temperature and surface characteristics. It will not survive the thermal tempering process or accept a chemical salt bath regardless of manufacturer; however x-ray lead glass is not required by any safety code to be "tempered". The good news is Ray-Bar X-Ray Safety Glass meets all current glass safety codes for impact resistance and is permanently labeled accordingly per ANSI Z97.1 and CPSC 16 CFR 1201 Cat 2 and IBC 2406 requirements for hazardous locations indoors, which is particularly applicable in a medical facility environment. Standard Ray-Bar frame throat telescopes fit wall thickness from 4-1/4" to 8".